The Boston University women’s basketball team will play its final game of the 2017-18 regular season on the road against Loyola University Maryland Wednesday night as the Patriot League Tournament approaches this upcoming weekend. The Terriers (10-17, 5-12 Patriot League) currently sit at ninth in the conference after falling 48-47 to the United States Military Academy over the weekend. 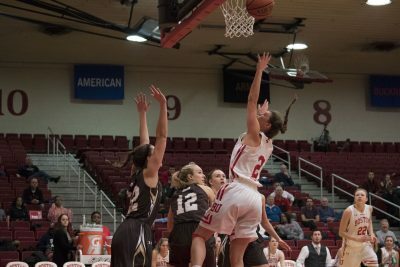 Despite going into the fourth quarter with a 38-32 lead over Army (16-12, 9-8 Patriot League), BU was unable to capture a win for its fourth straight game. The Midshipmen grabbed a 46-45 lead after a layup from junior forward Madison Hovren with 1:20 remaining. Senior guard Janae McNeal extended Army’s lead with a successful free throw. However, senior center Sophie Beaudry knotted the game with 25 seconds to go. The effort was not enough as McNeal netted another free throw and junior forward Naiyah Thompson missed her jumper. However, the Terriers have an opportunity to leapfrog Loyola (8-20, 6-11 Patriot League), as the Greyhounds currently sit in a three-way tie for sixth place with the College of the Holy Cross and Lafayette College. BU head coach Katy Steding said she wants to see her team pounding the paint aggressively in its matchup. The Terriers are feeling confident going into their game against the Greyhounds. BU won the first meeting between these two teams earlier in the season by the score of 75-56. Sophomore forward Nia Irving led the way with 21 points and seven rebounds off a stellar 10-for-12 shooting from the field. Freshman guard Katie Nelson also contributed 16 points and four rebounds, shooting 4-from-5 from beyond the arc. Should the Terriers emerge victorious again Wednesday evening, they will take a higher seed than the Greyhounds. Despite having the same record if this scenario were to happen, BU holds an edge in the tiebreaker, after having beat Loyola at home earlier in the season. However, the Terriers’ previous win did not come without resistance. Loyola sophomore guard Stephanie Karcz put up a double-double, consisting of 23 points and 13 rebounds, for her team. Freshman forward Isabella Therien also posed a threat, adding 15 points and seven rebounds. Therien currently leads all rookies in the league with 15.1 points per game and earned her seventh Patriot League Rookie of the Week award earlier this week. The Greyhounds snapped a five-game losing skid last Saturday against the United States Naval Academy, winning 58-40. Therien and Karcz played a large role again, contributing 17 and 10 points, respectively. Sophomore guard Alexis Gray also scored 15 points and added five rebounds. The team averages 59.5 points per game, while BU falls slightly behind with 58.9 points per game. The past three contests against the Greyhounds have gone BU’s way, and Steding said believes her team can continue its success and cap its season off with a win if it reels in rebounds on the defensive end. The end of the regular season means that the Patriot League tournament is right around the corner and the first round of the playoffs are slated to begin March 3. If the Terriers beat the Greyhounds, they will host the first round of playoffs, but if they lose then they will travel. While the playoffs loom ahead, Steding said her team is still taking it game-by-game.